This kit includes 1 Fuser, 1 Manual Feed pickup roller, 1 Manual Feed separation pad, 2 Cassette feed/separation rollers, 1 Cassette pickup roller. You can save some money by purchasing the fuser on exchange ; see exchange terms in details below. Alternate part number Q3984A, RG5-7691. 1. Will you be sending back your old fuser on exchange? Purchasing the fuser with a core exchange saves you money and is friendly to the environment. See the terms of the exchange in the yellow box below. 2. Do you want the PrinterTechs compatible fuser or the new HP fuser? PrinterTechs compatible fusers are fusers that are remanufactured by us, to our extremely high standards. 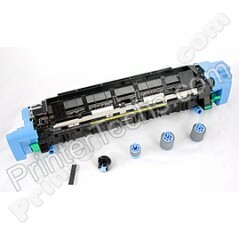 This kit is for use in the Color LaserJet 5550 series, NOT the Color LaserJet 5500 series.